Ridesharing replaces e-cards as the hot insurance topic of the year. 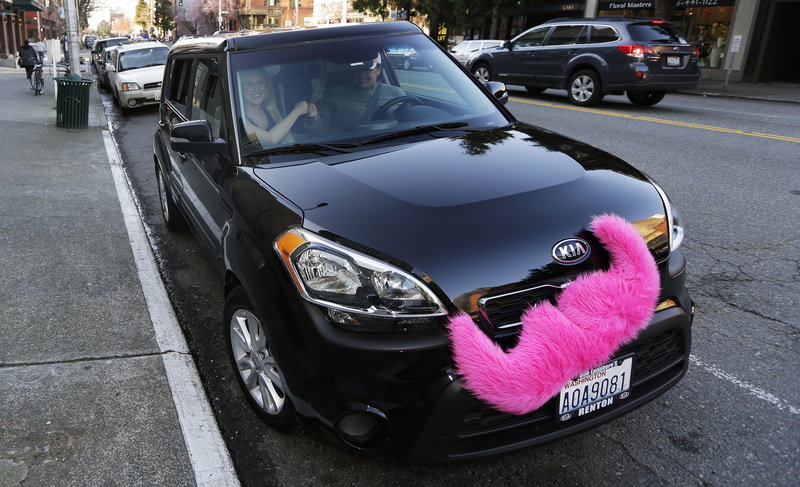 A Lyft car with its trademark pink moustache. State legislatures including Arizona, California, Colorado, Connecticut, District of Columbia, Florida, Georgia, Illinois, Maryland, North Carolina, New Jersey, Oklahoma, Pennsylvania, Rhode Island, Virginia and Washington have considered legislation. Most recently, California lawmakers sent Gov. Jerry Brown legislation (AB 2293) which is a well-balanced bill providing public protection by establishing reasonable insurance limits and creating a firewall that protects personal auto insurance from subsidizing commercial activities. AB 2293 gives TNCs flexibility to meet insurance requirements, which led to Uber and Lyft to support the legislation. Earlier this year, Arizona Gov. Jan Brewer vetoed H.B. 2262, which would have forced personal auto insurers to cover the riskier driving behavior of TNC drivers. Colorado Gov. John Hickenlooper signed legislation that sets up the framework for TNCs to provide primary insurance coverage for all commercial activity, including when drivers log onto their app and are available for hire through the time period when they have a passenger in the vehicle until the driver logs off the app and is no longer available to accept rides. Many states that did not act in 2014 are gearing up for legislative activity in 2015. Studies were called for in Connecticut and North Carolina, bills have been filed in Pennsylvania and New Jersey, interim legislative committee hearings are going in Nebraska and Kentucky. Lawmakers across the country are discussing the developments that have occurred in 2014 with an eye on legislative action next session. Over the year, the landscape involving TNCs and insurance has evolved as they have accepted more responsibility in providing insurance coverage. However, there are still some insurance gaps and the potential for disputes that the insurance industry wants addressed. PCI and our industry partners continue to work at the state and local level to support the development of solid guidelines so there is clarity regarding what insurance coverage is being provided and when it is in effect. This year there were also new developments with the “hot issue” of 2013: e-Cards, or electronic proof of insurance. The expansion of states that permit drivers to use their smartphones to display their insurance card continued. The trend of states modernizing their insurance laws has advanced quickly. In 2011, no states allowed drivers to use their cell phone to show proof of insurance in a traffic stop. This year, Delaware, Maryland, Rhode Island, South Carolina and South Dakota enacted e-card legislation and today more than two-thirds of the states have enacted laws or adopted regulations. More states also passed legislation that would enable insurers to conduct all policyholder transactions over the Internet with the consumer’s consent. The bills generally allow consumers to view their policy documents and information online instead of receiving them through the mail. We live in a world where increasingly everything is paperless, and giving the consumer the option to review or renew their policies online gives consumers more flexibility and choice. Modernizing the insurance marketplace benefits consumers and allows insurers to meet the increased demand by consumers who want to do business electronically. In 2014 Indiana, Iowa, South Dakota, Utah, and Wyoming enacted this type of legislation. There are now 18 states that allow electronic delivery of documents and notices. The other major e-commerce issues, electronic delivery of insurance information, also experienced gains. In 2014 Arkansas, Indiana, Iowa, Maryland, Oregon, South Dakota and Wyoming enacted this type of legislation that allows electronic delivery of documents and notices. Now, nearly half (24) of the states have adopted legislation that enables insurers to conduct all policyholder transactions over the internet with the consumer’s consent.